An Accounts Receivable Supervisor generates revenue for the firm by initiating invoices, resolving missing or outstanding payments, supervising staffs and updating the financial records. 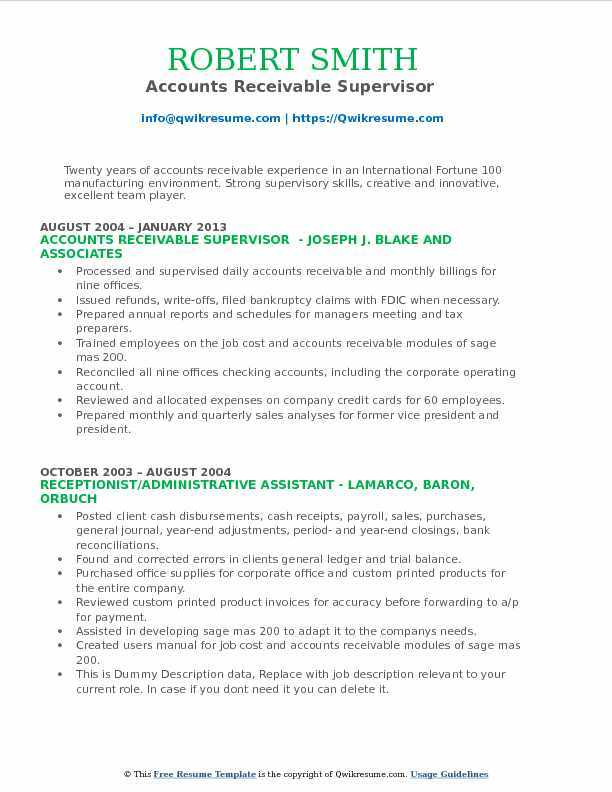 The job description for accounts receivable supervisor includes – ensuring complete accounts receivable accountability, training other staffs, forecasting cash for financial planning, controlling bank remittances, monitoring and coordinating the sales orders, posting periodical accounting records, adhering to internal accounting controls and maintaining financial security. 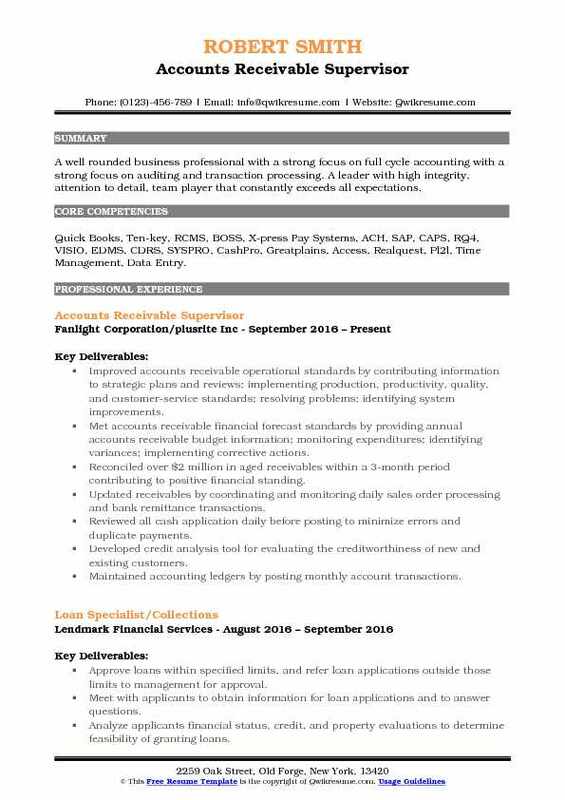 When looking out to fill for this post, the hiring employers normally look out for an Accounts Receivable Supervisor Resume Sample that contains a Bachelors degree in Accounting or finance preferably. 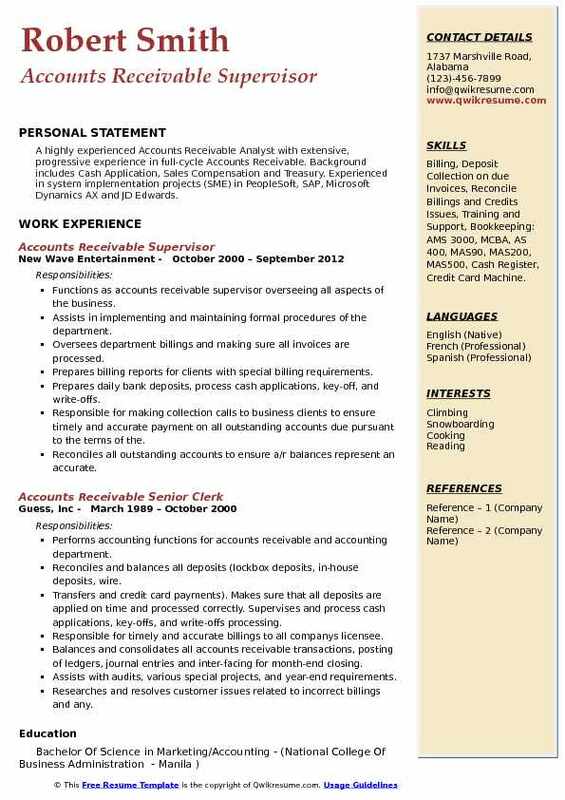 Few years of experience with expertise in accounting skills, thoroughness, general math skill, managing capacity, supervision, and confidentiality, however, is regarded as the best Accounts Receivable Supervisor resume. Headline : An Accounting Professional with experience as a supervisor working in the environmental industry. My expertise is in Accounts Receivable, with proficiency in Quick Books. I am able to work in a high volume and fast paced work environment. Develop professionals for account receivable teams and design performance indicators. Administer various processes and controls for customer accounts and prepare report for appropriate functional areas. Administer all account receivables for portfolio and maintain a reserve for debt and third party collections. Perform research on all activities for collection and minimize all receivable balances. Administer and maintain collection for all delinquent accounts at location site. Prepare and reconcile all account receivable accounts and prepare monthly reports for same. Monitor all collection activities and develop processes to improve cash flow and downsize receivables. Coordinate with customer, analyze requirement and maintain records for services. Prepare records of audits, schedule time for all account receivables and documented process. Provide technical support to billing and collection department and ensure compliance to company standards. Supervise efficient working of account receivable staff and provide required assistance. Administer all collections according to required policies and procedures and perform all billing functions. Supervised and trained two staff members in the a/r department. Monitoring and setting performance levels and weekly review of progress and achievement. Objective : Dynamic, analytical, and goal-driven professional with extensive experience in accounting, staff supervision, general management, and customer service. Adept at facilitating training for the staff toward the accomplishment of organizational goals and objectives. Capable of working effectively with diverse groups of people within fast-paced environments; as well in adapting to new ideas. Directed and coordinated the daily activities of assigned team members. Assumed accountability for meeting expected outcomes through effective, efficient and ethical team operations. Provided quality assurance assessments back to billing specialists on a weekly basis and recommend corrective action when appropriate. Acted as the contact person for the contracted facilities for questions and addressed accounts that were past due. Possessed an enthusiastic and forward thinking approach to leadership and the potential for the billing department. Oversaw the supervision, planning, scheduling, and assignment of work to billing staff. Utilized appropriate data and statistical information to analyze trends and render recommendations pertinent to department effectiveness. Worked with hr to ensure a thorough, efficient and fair process for the evaluation, hiring and on boarding of new hires. Ensured that all customer service issues are properly identified and managed. Was able to think clearly, remain calm, and act quickly with sound judgment in emergent or stressful situations. Able to perform multiple related tasks simultaneously and effectively. Reviewed transports to determine if insurance, the contracted facility or the patient should be billed. Headline : Accounting Supervisor with a history of strong, efficient team management and superior customer service. High level of personal integrity and team accountability. Experienced in identifying process wastes and continuously implementing improvements. Dedicated to promoting customer and employee satisfaction. 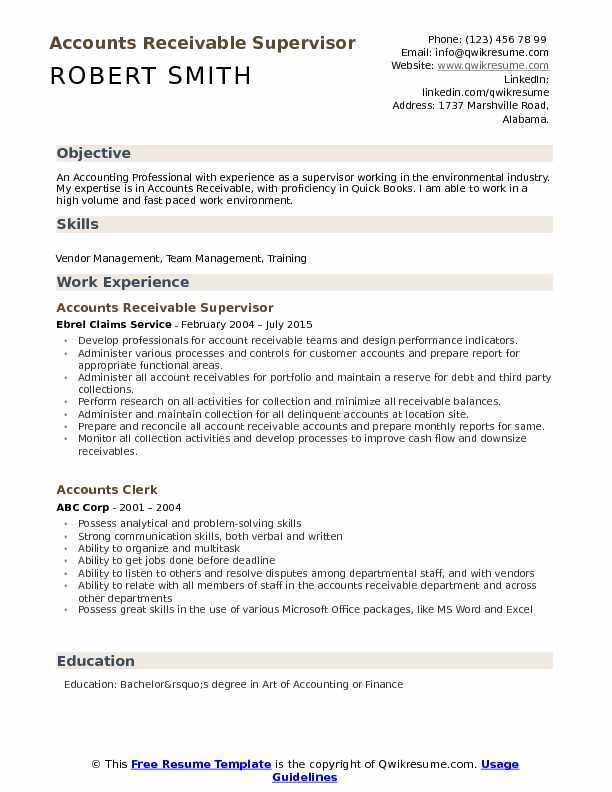 Skills : Account Receivable, Billing, CREDIT, GL, Quickbooks. Cash applications & collections: manage ar team members in timely, accurate application of daily cash receipts and resolution of discrepancies. Lead weekly companywide ar collection committee to resolve outstanding balances. Investigate and collaborate with internal associates on root cause analyses of invoice aging issues. Routinely communicate with customers to collect past due balances and reconcile customer accounts payable. Ledgers with internal accounts receivable ledgers. Manage customer database. Develop weekly automated customer statement emails. Coordinate with third-party agencies on to collect significantly delinquent balances. Integrated multiple acquisitions legacy accounts receivable and billing systems into existing ERP and processes. Prepare management report and accompanying schedules, worksheets and narratives for monthly reporting "board book". Provide executive summary and documentation of significant balances and metrics and meet all other management requests for monthly board of directors meeting. Generate and distribute weekly reporting of invoicing totals/aging totals/cash receipts/invoice adjustments to management and business segments. Establishing and managing limits, monitoring and reporting on deviations from credit standards. Created and documented new bad debt reserve calculation method and complete monthly reserve testing. Formalized. Summary : Self-motivated service-focused professional seeking to leverage both experience and education as accounts receivable manager. Demonstrated a history of successful financial management and corporate accounting. Supervised invoicing process of over one-hundred magazine issues annually. Prepared monthly sales reports for management review and final approval. Researched, troubleshoot, and implemented solutions related to sales and accounting software. Managed accounts receivable related to billing, daily cash receipts, and other activities as assigned. Ensured timely payables, collection and processing activities dealing with the company-owned real estate. Responsible for creating, updating and maintaining database attributes utilized by sales, accounting and production staff. Interfaced with support personnel such as information technology, sales, marketing and senior level. Developed, implemented and managed company-wide standard operating procedures resulting in more efficient office management, record-keeping and invoicing processes. Spearheaded product research, data integrity testing between legacy systems and newly implemented. Successfully lead the implementation of company software purchases used in multi-faceted activities. Successfully created system set-ups, coordinated and provided company-wide training on newly. 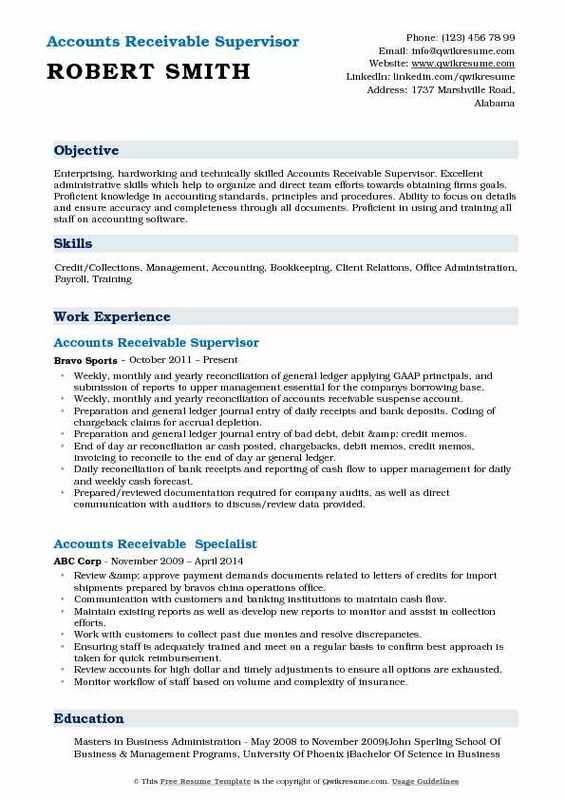 Summary : Seasoned Accounts Receivable with 6 years experience in managing accounting needs across multiple platforms. Advanced technical knowledge, including Outlook and Excel. Ensuring that all orders were invoiced and mailed to customers. Made sure invoices balanced with daily journals. Responsible to see that payments were applied to customers account accurately and managed the collections on delinquent accounts. Manage the fiscal and tax reports at the end of each month. Owned and managed the Month-end closure of accounts receivable. Ran reports and calculated A/R journal entries. Reconciled A/R deposits to the general ledger. Monitored the printing and mailing of billing statements. 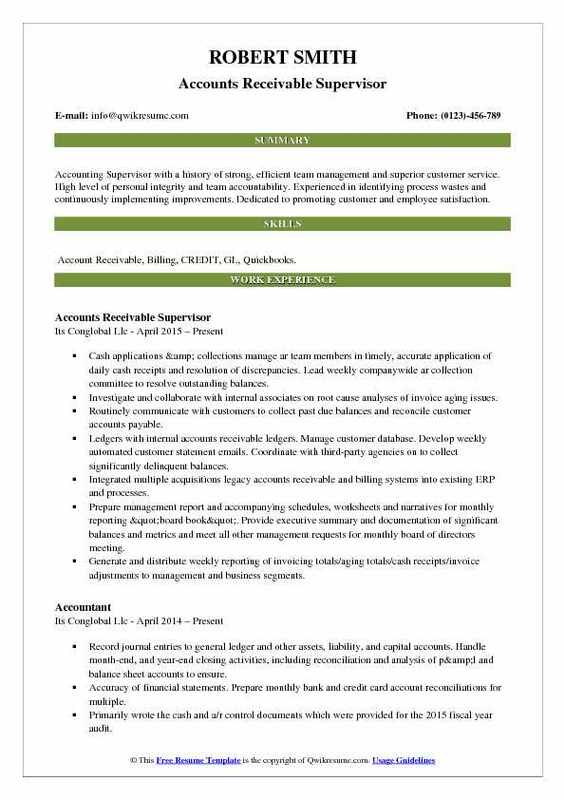 Directs and manages billing collections personnel and all activities related to the collection of accounts receivable including AR analysis, process, and systems workflow development, appeal submission and follow up, negotiate settlement agreements, and payer trend analysis. Regularly assesses practices within the department and the company to identify areas of significant opportunities for improved financial gain and services or product lines. Streamlined reporting process and functions to facilitate accountability, reliability, and accuracy of information. Spearheaded project to implement new accounting software in the ar department (arcs). 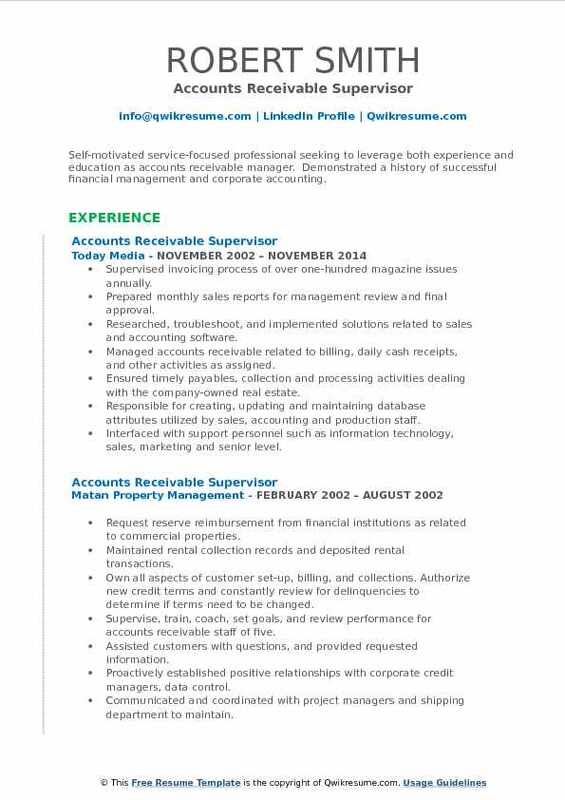 Summary : Enterprising, hardworking and technically skilled Accounts Receivable Supervisor. Excellent administrative skills which help to organize and direct team efforts towards obtaining firms goals. Proficient knowledge in accounting standards, principles and procedures. Ability to focus on details and ensure accuracy and completeness through all documents. Proficient in using and training all staff on accounting software. Weekly, monthly and yearly reconciliation of general ledger applying GAAP principals, and submission of reports to upper management essential for the company's borrowing base. Weekly, monthly and yearly reconciliation of accounts receivable suspense account. Preparation and general ledger journal entry of daily receipts and bank deposits. Coding of chargeback claims for accrual depletion. Preparation and general ledger journal entry of bad debt, debit & credit memos. End of day ar reconciliation: ar cash posted, chargebacks, debit memos, credit memos, invoicing to reconcile to the end of day ar general ledger. Daily reconciliation of bank receipts and reporting of cash flow to upper management for daily and weekly cash forecast. Prepared/reviewed documentation required for company audits, as well as direct communication with auditors to discuss/review data provided. Daily and weekly communication update on all accounts to ar manager, controller & CFO of payment trends, deductions, and payment forecasting. Creation and implementation of improvements in the preparation and cash application of receipts for more efficient ledger journal entry. Supervision of ar department staff, project coordinator, and liaison to CFO during ar managers absence. Summary : Twenty years of accounts receivable experience in an International Fortune 100 manufacturing environment. Strong supervisory skills, creative and innovative, excellent team player. Processed and supervised daily accounts receivable and monthly billings for nine offices. Issued refunds, write-offs, filed bankruptcy claims with FDIC when necessary. Prepared annual reports and schedules for managers meeting and tax preparers. Trained employees on the job cost and accounts receivable modules of sage mas 200. Reconciled all nine offices checking accounts, including the corporate operating account. Reviewed and allocated expenses on company credit cards for 60 employees. Prepared monthly and quarterly sales analyses for former vice president and president. Researched and negotiated pricing for custom printed announcement cards, new business cards for all employees, and banking supplies for new managing partners after the company changed ownership; presented my research and recommendations to managing partners. 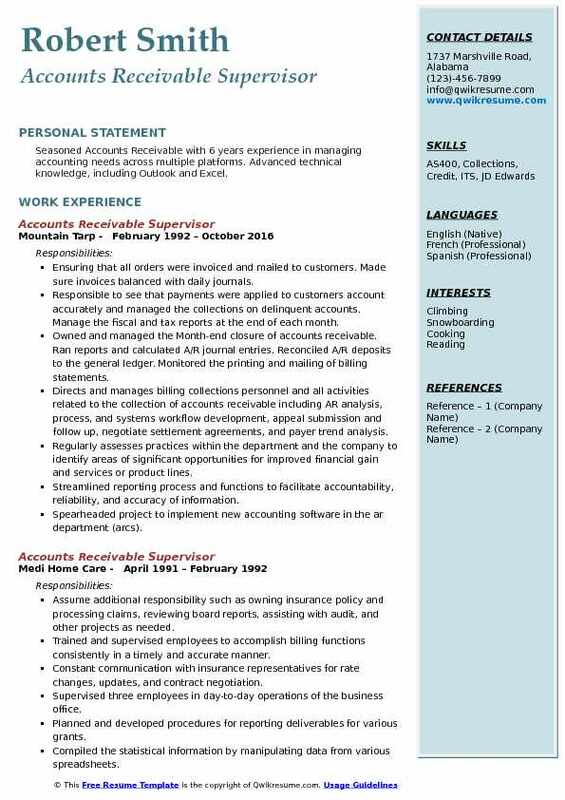 Objective : A well rounded business professional with a strong focus on full cycle accounting with a strong focus on auditing and transaction processing. A leader with high integrity, attention to detail, team player that constantly exceeds all expectations. Skills : Quick Books, Ten-key, RCMS, BOSS, X-press Pay Systems, ACH, SAP, CAPS, RQ4, VISIO, EDMS, CDRS, SYSPRO, CashPro, Greatplains, Access, Realquest, Pl2l, Time Management, Data Entry. Improved accounts receivable operational standards by contributing information to strategic plans and reviews; implementing production, productivity, quality, and customer-service standards; resolving problems; identifying system improvements. Met accounts receivable financial forecast standards by providing annual accounts receivable budget information; monitoring expenditures; identifying variances; implementing corrective actions. Reconciled over $2 million in aged receivables within a 3-month period contributing to positive financial standing. Updated receivables by coordinating and monitoring daily sales order processing and bank remittance transactions. Reviewed all cash application daily before posting to minimize errors and duplicate payments. Developed credit analysis tool for evaluating the creditworthiness of new and existing customers. Maintained accounting ledgers by posting monthly account transactions. Chief support in semi-annual and annual company audit for accounts receivables. 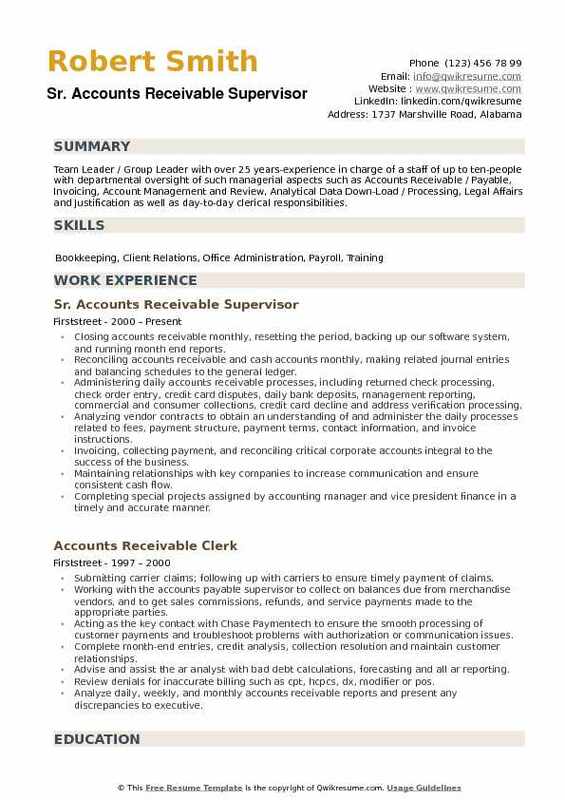 Served as accounts payable supervisor back-up assuming all ap roles during the absence. 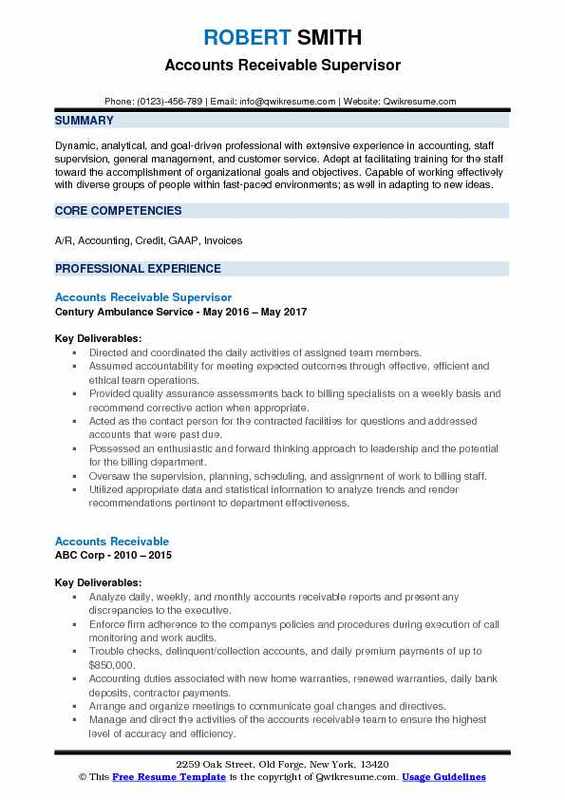 Summary : A highly experienced Accounts Receivable Analyst with extensive, progressive experience in full-cycle Accounts Receivable. Background includes Cash Application, Sales Compensation and Treasury. Experienced in system implementation projects (SME) in PeopleSoft, SAP, Microsoft Dynamics AX and JD Edwards. Skills : Billing, Deposit Collection on due Invoices, Reconcile Billings and Credits Issues, Training and Support, Bookkeeping: AMS 3000, MCBA, AS 400, MAS90, MAS200, MAS500, Cash Register, Credit Card Machine. Functions as accounts receivable supervisor overseeing all aspects of the business. Assists in implementing and maintaining formal procedures of the department. Oversees department billings and making sure all invoices are processed. Prepares billing reports for clients with special billing requirements. Prepares daily bank deposits, process cash applications, key-off, and write-offs. Responsible for making collection calls to business clients to ensure timely and accurate payment on all outstanding accounts due pursuant to the terms of the. Reconciles all outstanding accounts to ensure a/r balances represent an accurate. Prepares and distributes the appropriate weekly, monthly a/r reports for the assigned accounts. Balances and reconciles all accounts receivable transactions, posting of ledgers, and journal entries. Assists with audits, various special projects, and year-end requirements. Summary : Team Leader / Group Leader with over 25 years-experience in charge of a staff of up to ten-people with departmental oversight of such managerial aspects such as Accounts Receivable / Payable, Invoicing, Account Management and Review, Analytical Data Down-Load / Processing, Legal Affairs and Justification as well as day-to-day clerical responsibilities. Closing accounts receivable monthly, resetting the period, backing up our software system, and running month end reports. Reconciling accounts receivable and cash accounts monthly, making related journal entries and balancing schedules to the general ledger. Administering daily accounts receivable processes, including: returned check processing, check order entry, credit card disputes, daily bank deposits, management reporting, commercial and consumer collections, credit card decline and address verification processing. Analyzing vendor contracts to obtain an understanding of and administer the daily processes related to fees, payment structure, payment terms, contact information, and invoice instructions. Invoicing, collecting payment, and reconciling critical corporate accounts integral to the success of the business. Maintaining relationships with key companies to increase communication and ensure consistent cash flow. Completing special projects assigned by accounting manager and vice president finance in a timely and accurate manner. Training sales representatives on how to properly obtain payment information from customers.